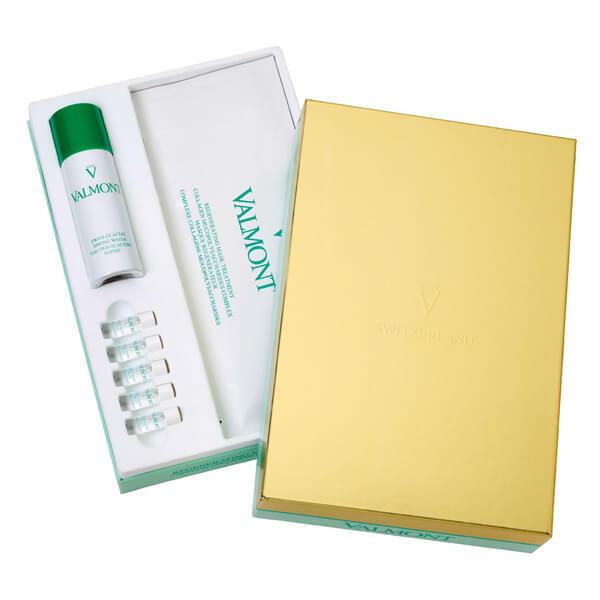 Improve the appearance of skin with Valmont Regenerating Mask Treatment, a pack of five collagen face masks to be used in conjunction with the Glacial Water and post-collagen ampoules provided. Offering a comprehensive, pamper experience, the active face masks are made from pure and native collagen, and are enhanced by the Glacial Water included. The active mask treats skin in its own right, but also acts as an excellent delivery system for the nutrients and minerals packed into the Glacial Water. Simply spray the mask with Glacial Water, adhere to skin and allow the beneficial ingredients to infuse, intensely hydrating and visibly improving texture. Promoting maximum penetration, the face masks and Glacial Water work in synergy to restore firmness and elasticity whilst smoothing the appearance of fine lines and wrinkles for a younger, brighter-looking canvas. After use, skin is glowing and youthful in appearance.